Click on the 'add new' tab on the editing bar and select 'page' or 'file' from the pop-down list. For a page, name the page. The short name will appear in the url (don't add a .html suffix) and the title will be the title (appearing in the head bar of a browser) and h1 heading of the page. If you do nothing, the short name will be automatically generated by lowercasing and hyphenating the title. You can add your own shortname or edit the one generated, but it must not contain either upper case letters or spaces. If you want to add the content to pages now you can, otherwise you can come back to do that once you have a set of pages ready to populate. Then save the page. For a file, browse to the file you want to upload and select it. If you upload it without doing anything else, both the shortname and the title will be the existing file name. You can fill in these fields instead if you want to. If you add your own shortname or edit the one generated it must not contain either upper case letters or spaces. If you have a batch of files to add, you can do it through adding a 'quick upload' portlet to the right side of folder. You then see the created item, and if you are ready, you could publish it (select the right-hand 'state' tab and choose 'publish' from the pop-down). If you wish to assemble the content in full before publishing it, you can publish a folder and contents later. In a standard Apache web server there is usually a page in a folder called index.html, which is set as the default page for display when there is a request for a folder. In Falcon you get to choose which page is shown as the default page when a folder is requested, instead of seeing the pages listed in the content area of the screen. 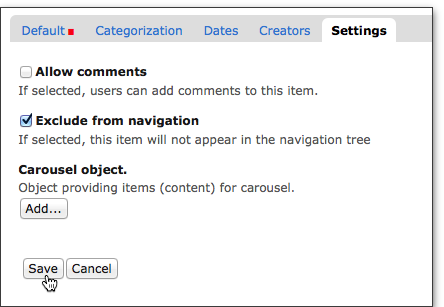 The page you elect to become the default page is shown in the site navigation pop-down and left-hand navigation as the '... overview' page, named for the folder it is within - this label cannot be changed (it needs to be there for the functionality of the mobile navigation). At the top level of your folder, in the edit bar go to ‘display’ and select ‘select a content item as default view…’ then select the page you have created for the introduction. If you go to the contents view of the folder, the default page will now be shown in bold. Now when you go to the top level of a folder and select ‘edit’, at the top of the editing screen you will see a message warning you you are editing the default view of the container and not the container itself, and giving you a link to do that. Once you have uploaded a file, whether it is a Word file or a pdf, there is an option that you can replace the file with another version. This has the advantage that all the links that you have already made to that file will still work, so for updates of course information or staff lists it is optimal. Select 'Replace with new file', browse to select the new file and upload it, then save. The entry with the page title will disappear from the left-hand navigation. See 'Organising your left hand navigation'.